Tammy Murphy needs a favor: will you please house one of her hubby’s Sky Blue players? I’m going to assume that MOST people reading this are aware of the drama surrounding Phil Murphy’s beleaguered Sky Blue soccer team and the horrendous athlete living conditions (including plastic bags on windows?!?!) which have made headlines in the New Jersey media. If you’re not? Here’s the background. 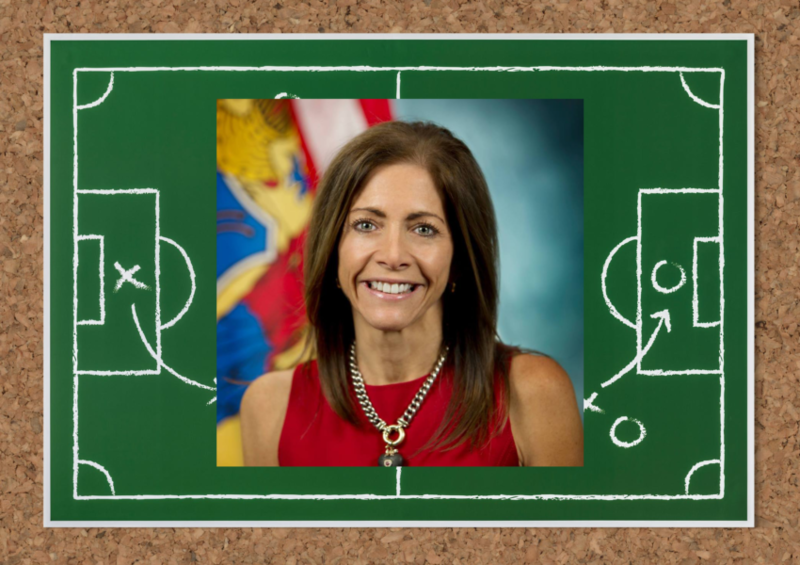 Let’s get on with the latest: this Tuesday morning, First Lady Tammy Murphy was announced as the new ‘sheriff’ who’d step in and take an active role in overseeing reform at the women’s soccer club. The statement is on Sky Blue’s website. Improved housing, better training facilities, and an overall better player ‘experience.’ Her hubby is barred from direct involvement because of his blind trust; it’s up to Tammy to put a positive new face on very bad situation. Then? At 4:24 p.m. that same day? A friend of Save Jersey received the following e-mail from New Jersey Youth Soccer. 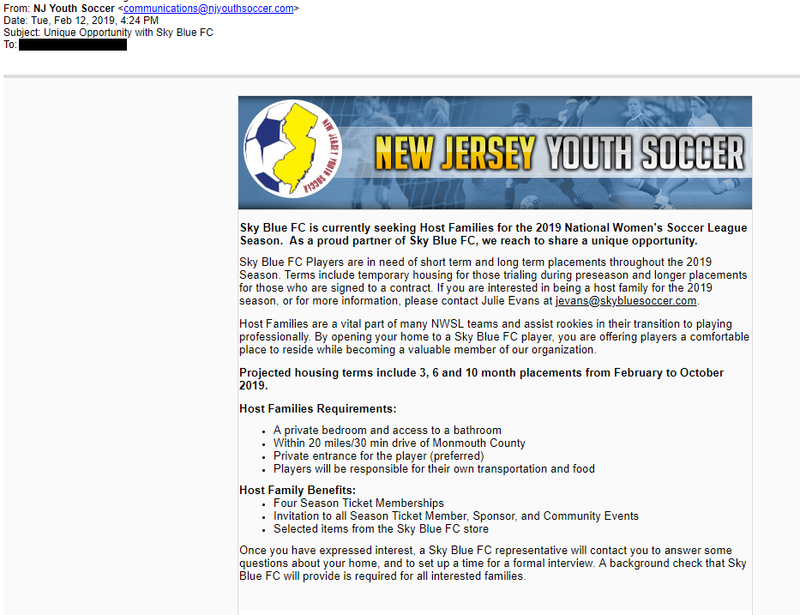 Apparently, Sky Blue is reaching out to the state’s soccer community to locate Monmouth County-area families (the Murphy’s own a gigantic mansion in Monmouth) interested in boarding Sky Blue players. You read that correctly! “By opening your home to a Sky Blue FC player, you are offering players a comfortable place to reside while becoming a valuable member of our organization,” the email explains, asking anyone interested in providing “short term and long term placements throughout the 2019 Season” to contact an organization representative. The first big solution of the Tammy Murphy era is apparently to ask others to pick up the slack for a multi-millionaire’s shabbily run company that treats its employees worse than third class passengers on the Titanic. She punted (pardon the pun). Keep in mind that these two (Phil and Tammy) have the money to BUY a hotel if need be to give these young players the respectful living conditions they deserve. I’m not up on women’s soccer league rules, but then again, I’m getting a sneaking suspicion that Phil Murphy isn’t an expert on the ins-and-outs of women’s soccer either. The we’re “on it” emails can’t be far behind, folks.